It draws a complete scale of the fretboard of the guitar and adds fretlines to it. 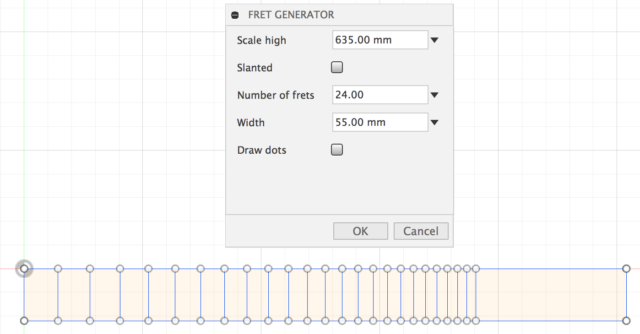 You can change the amount of frets and scalesize. Also you can change the width of the fretboard. The extra feature is that it also gives you the possibility to make slanted frets. 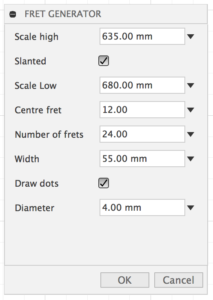 All you have to do is select the slanted checkbox, enter the scale for the lower part of the board and the plugin does the rest for you! You can even have up to 36 frets and draw dots with desired diameters. It also draws a center constructionline. The fretboard is drawn on the center of the x-axis to make it easier to model. The video gives you a short overview.